Every day real estate leads are trying to find you. These leads are trying to find you while they’re eating breakfast. While they’re at “work”. Even while they’re watching Netflix. 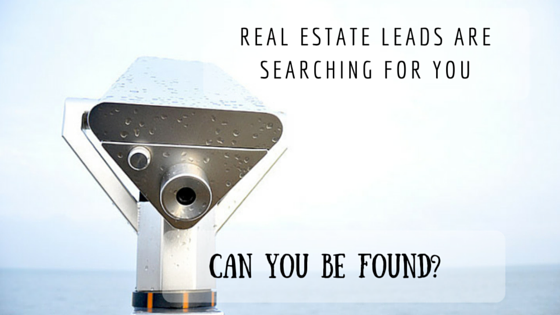 Like so many Realtors, you might not be giving those leads a chance to find you. “How are leads trying to find me?” you may ask. The Internet. The methods home shoppers and home sellers use to find a Realtor have had a significant change in the past decade. Still the best way to get new leads is through referrals, and that will likely never change. In fact, 41% of buyers used an agent that was referred to them by a friend, neighbor, or relative, according to the National Association of Realtors Profile of Home Buyers and Sellers 2015. But what about the buyers and sellers who haven’t been given a referral? These potential leads are the other 59% of buyers. They need a Realtor, but how do they find a Realtor? The answer is actually very simple. Most people who want to buy a home start with the Internet, and 92% of home buyers use the internet at some point during their search. If you want a home buyer to find you, you need to be on the Internet with a personal website. The internet is where the leads are! Bob wants to buy a house. He knows he should use a Realtor to help him with the process. But Bob doesn’t know where to start. Like the majority of home shoppers, Bob hasn’t been given a referral to a Realtor. You want Bob to contact you. Bob’s first instinct, and the instinct of 92% of home shoppers is to hit the internet. Since Bob wants to buy a home in Anytown, which is where you happen to be a Realtor (go with me on this one), he searches Google either for homes or for Realtors in Anytown. What do you think comes up in Bob’s search? Zillow, Trulia, and major brokerages are the top results, which are little help to Bob, unless he just wants to browse homes (Pro Tip: Your Zillow and Trulia profiles should include your website address). You want Bob to find your website. If you have a website through your Brokerage, Bob will never find your website. What do you think Bob is going to do? Bob might click on a brokerage’s website, but then he will quickly learn that doesn’t really help him with his goal of finding a Realtor. Not when he goes to the “Agents” section of the brokerage website and is overwhelmed by head shots of the entire office. How many agents are in your office? What reason does Bob have to choose you over every other agent in your office? Bob does back to his Google search and scrolls down the page, he finds a few Realtors’ websites, and even more Realtors on the 2nd page of his search. Bob will click on the first actual Realtor that shows up in his Google search. That Realtor is not a guaranteed winner of Bob’s business, but the first Realtor to show up in Bob’s Google search definitely has the advantage. When Bob finds your website, you want Bob to connect with your brand, your niche in real estate, and your personality. It is important that Bob has a good idea from your website if you are a good fit with his needs and personality. A website with a Realtor’s brokerage is not personal. It is an absolute necessity for a Realtor to have a personal website. If you heard that 59% of home shoppers were at the coffee shop down the street looking for a Realtor, would you go to the office instead and start calling people off the lead list you just bought? Or would you hustle over to the coffee shop with a stack of business cards and notebook? Leads are using the Internet. Go where the leads are hanging out. You need a Internet presence by having a website. There are countless Realtors in your area. There is only one Bob. You may be the best Realtor for Bob, so you need to make sure that Bob can find you. Having a personal website increases the chances that Bob finds you. So the question is, what are you going to do? Be a glamour shot on your Broker’s website? Or get your own personalize website so Bob can find you?